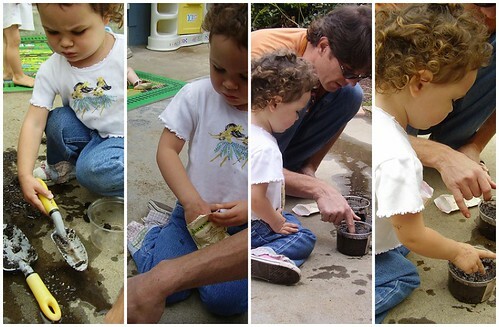 Yesterday we took the girls to a friend’s house to plant some seeds. Lily thought the dirt was icky and didn’t want to touch it, while Anya thought it might be fun to eat it. After much cajoling we got Lily to drop the seeds she picked out (corn and beets) into the little holes Mark poked in the soil before she ran off to play with the toys. The little plastic tubs are now sitting out on the deck in the sun, just waiting for sprouts to emerge. Hopefully Lily will be appropriately amazed when we see some green... and hopefully Anya won’t eat the poor little seedlings. Newer PostSeriously, do they make fingers any heavier?